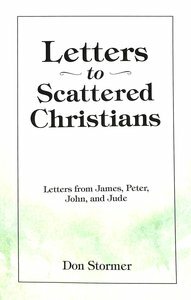 About "Letters to Scattered Christians"
Don Stormer has been active in a teaching ministry for many years. After several years as a secondary school teacher in New Zealand, he and his wife, Helen, went to Fiji in 1976 where Don became Principal of Gospel High School. After a further period in New Zealand and a second term of service in Fiji, they went in the late 1980s to Sydney, Australia, where Don was Academic Dean of Emmaus Bible College. Later, he served as Principal for a number of years. Since then, Don has been involved in an itinerant teaching ministry in different local churches and has had opportunity to teach by interpretation in South Korea, Romania, Moldova, and Armenia.